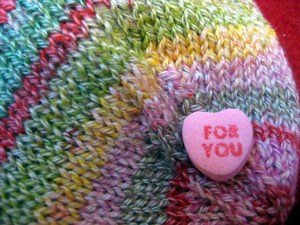 I don’t knit for Christmas but this year I did knit for Valentine’s Day. First, there were the Jaywalkers for Jessica. And second, there are these for Hannah. 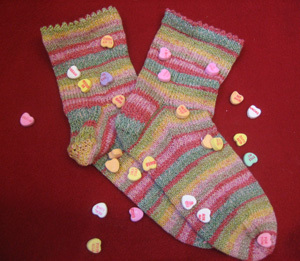 I call them Conversation Heart Socks because the colors remind me of conversation heart candies, which makes them a perfect present for this holiday. The yarn is Online Supersocke 100 in the colorway Summer. And I sure could use a little Summer today. However, since that doesn’t appear likely, I’ll settle for candy. These will be gifted at dinner tonight, along with a box of candy for each of the girls. Cute socks — you wanna be my mom? Never mind that I am [undoubtedly] old enough to be YOUR mother. Do you like Online sock yarn? I’m midway through the first sock of two pairs intended as gifts, and I think it feels like knitting with wool string. Or wool wire. Mine is Online Highland, iirc. I like the way the finished knit looks, I just don’t like the feel of the yarn through my fingers. Love the socks — you wanna be my mom? Never mind that I’m [undoubtedly] old enough to be YOUR mother. Do you like Online yarn? I’m midway through the first sock of two pairs to be gifted, and I think the yarn feels like wool string. Or wool wire. I like the finished fabric pretty well, just not the feel of the yarn through my fingers. Mine is Online Highland, iirc. Love the socks! Happy Valentine’s day! What great sock colors. I actually thought the first ones were handspun at first. I am sooo jealous of all these beautiful socks out there. Why don’t mine knit themselves faster? Those are both adorable! Do you make the labels up yourself? What a GREAT gift idea for Valentine’s day! I’m going to steal that idea for my step-daughter for V-Day next year! Darling labels too!! Love the socks esp the conversational ones! 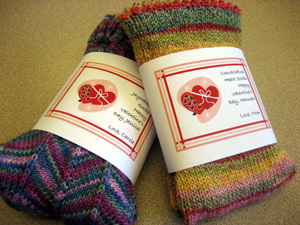 Gorgeous socks and a great idea to give them to your Valentines! I am curious about your picot edgings. 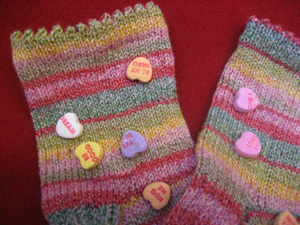 I normally do toe-up socks, and I tried the instructions found in this Knitty article. My cuffs roll really bad now! How do you do your picot to make sure they don’t roll? Any suggestions or a website/book/magazine you found your techniques from? Carole, I have had this post saved in my bloglines for months as I tried to find Online Supersocke 100. Could you or any of the other readers (though I don’t know who will see this since it is months after the event) direct me to a US distributor page or an online source either locally or abroad? Where did yours come from? Thanks for the help.